Intentions are like plans, strategies to get what we want from our behaviours and our conversations. They are derived from our beliefs, emotions and past experiences and they have strong influence on the course of our conversations and how we respond. They often remain hidden within our subconscious and we are mostly unaware of them and their impact. What are some examples of intentions and how they influence the conversations we have? In this article we will explore intentions from the perspective of three common roles. There would be many teachers who have the intention of teaching students to a set standard and many of us would be satisfied with such an intention. How could such an intention impact the conversations teachers have with students? Teachers develop the skills and the authority to teach students. They understand what students must learn, when and how. It is their job. The problem arises when the students don’t want to learn that way or don’t know how. These students challenge the teacher’s intention to teach and so the teachers may resort to telling, selling, & yelling to try and get the students to learn. The teacher can become so determined in getting the student to learn that the pressure forces the student to react becoming defensive and resistant, and they shutdown their ability to learn. What does the teacher do now? Their intention is still to teach students and so it is highly likely that they will do more of what they know. They continue with the same conversation patterns of telling, selling, & yelling further eroding the level of trust and respect. Little learning is achieved, and a lot of trust and respect is lost. What if a teacher’s intention was different? What if their intention wasn’t to teach but to lay a foundation of trust in the class, creating a place for students to experiment, learn, fail, and co-create solutions? Many parents lament of their teenage children; their behavior, lack of interest in the family, and their desire to disobey and argue. They just want the child to change. Almost every parent wants to raise good kids and to give them the best life possible. However, they often add an intention or two around this such as “do as I say”, or “mummy knows best”, or even ‘be my best friend”. What happens when the teenager rebels? Parents can feel threatened, confronted, and start to judge and criticize the child. Their conversations become protective and defensive. They can stop listening to the child and not being open to influence. The relationship between parent and child destabilises. If a parent was to have one of these as their intention, what would their conversations be like with the teenager? Parents would come from a perspective of accepting and appreciating rather than dismissing and judging. There would be more questions and less talking. A child will feel respected and listened to. Finally let’s look at the intentions of a leader. If you are a leader, what is the intention you have for your team? Each of these will have a very different impact on the conversations you have with your people. Their impact will be widespread affecting business systems, culture and the profitability of the company. The first three intentions, listed above, could see team members less as people and more as objects that get work done. The conversations focus more on productivity, costs, budgets, and performance and less on aspirations, individual development and creativity. Meetings are often places where intentions clash and impacts are readily observed. What are some of the costs of these types of intentions? The fourth in the list “to do the best you can” is a safe intention that doesn’t inspire greatness or growth. Being your best can create a mindset of defeat or denial as you will always have an excuse (we’re all doing the best we can). The conversations tend to lack accountability, commitment, and responsibility creating a culture that can be suffocating. The final intention in the list; to be a high performing team, opens the mind up for new possibilities. What does a high performing team look like/feel like/work like? What needs to be done differently? How will it work? What is possible? What barriers will we face? What will be our vision? How will we get there? The conversations boost energy levels and are co-creative forming a way of working better together and being united under a common vision. The focus is on development, creativity, and aspiration which underpins the achievement of KPI’s etc. The conversations are supportive not judging, they are about growth not dismissal, and they keep the team progressing forward together. This article considers intentions from three different perspectives, that of a teacher, parent, and leader. Whilst intentions can come from a good place within us, their impact may not align well. Becoming aware of our intentions, particularly if we are having an important conversation will prompt you consider what you want to say and how. These few moments can mean the difference between a positive and a negative impact. Every conversation we have will be underpinned by an intention. Every intention will have an impact. When we change our conversation, we change worlds. Last Sunday I lost one of my true best friends to cancer. She was my coach, confidante, teacher, and mentor. I say this and yet we had never met in person. The conversations we had were always positive and inspiring. She never sugar coated the truth and instead spoke about it in a way that was helpful and not fearful. She was able to lift my mindset from searching for threat, to thinking about possibility and discovery. Her skill was in asking great questions. My friend’s legacy for me is to spread the importance of having healthy and courageous conversations. The conversations that engage, excite, and connect us. Whilst they can also be challenging and uncomfortable, their intention is always to build trust and relationships. It doesn’t matter if you are talking in a meeting, to a client, or with a team member, if your intention is, first and foremost, to build the trust and the relationship it will completely change the nature of what you say and how you say it. Try it and observe what happens. Normally we are unaware of our intentions when we engage in conversations. Our intention could be to win the argument, to influence someone to your way of thinking or, to change their behavior. When we don’t get what we want from the conversation we blame the other person and tend to judge them negatively. Sadly, the fault is all ours because we don’t have the skills or the how-to to hold a better conversation. When I coach clients, our most engaging conversations focus on building awareness into their conversational patterns. This is an area very few of us have a lot of insight. My clients learn how changing these patterns will bring about significant improvements in how they interact with others. This isn’t easy work, change is hard for everyone. It takes courage, effort and practice. The results however, come quickly. Many of my clients are technical and engineering professionals, and I’ve seen how these insights and discoveries have had a profound effect on their ability to influence and motivate others. They can soon see that everything happens through conversation. The impact my friend has had on global corporations, children, leaders, and me is phenomenal and cannot go unrecognized. And she has done this all through the power of conversation. Mastery of conversations is one of the rare skills that transcends religion, race, culture and language. Every day most companies will experience some level of conflict and very little of it will be good or healthy conflict. Workplace conflict is mostly disruptive and conflict management takes up a lot of time and effort. It might be overt such as people struggling with a “Personality Clash” or, it could be covert, bubbling to the surface as back stabbing and workplace gossip. Conflict like this erodes relationships, cultures, and trust. Conflict management is difficult and unpleasant. So, can conflict be good? Is there such a thing as healthy conflict management? Conflict is simply a situation where two or more people have strong views. Good healthy conflict can also be called robust conversations and debating. Knowing how to navigate tough conversations is essential in effective conflict management. How often have you experienced robust conversations? Can you recall how good conflict can feel? Conflict can be inspiring, it can make you think deeply and force you to consider different perspectives. Good conflict nurtures us, challenges us, and keeps us learning. Sadly, the conflict we are most familiar with happens because our conversations leave us assuming, judging, and misunderstanding. We listen to our inner voice rather than seeking clarity and meaning from others. We put our own opinions and ideas ahead of others and we listen only to confirm what we already know. As a result many of us see conflict as threatening, personal, and something to be avoided. However it is unhealthy conversations that create unhealthy conflict. Our fear networks can be triggered by our words and our conversations and this can override our rational and creative thinking. We turn our thinking inwards and resort to protective behaviours such as denying, criticism, and judgment. We are not open to influence and we stop listening when we are triggered. One of the most valuable life and leadership skills we can gain is self awareness. When we are aware of what triggers us and/or when we feel that we are being triggered, we can learn to override this. Through conscious awareness we can engage our rational thinking and our curiosity, changing the nature and energy of the conversation. We have the power to turn an unhealthy conversation into healthy conflict by changing our words. So what are some healthy conflict management strategies? The very first step to creating good healthy conflict is providing people with the understanding, skills, and know how, for holding difficult conversations. When people have the conversational skills to deal with issues, and the know how to work together to co-create outcomes, the fear networks are less likely to be triggered. The second step is building trust. Our brains are open to engaging and sharing with others when we feel trust. Good healthy conflict can move the conversation into the unknown and this can cause people to feel uncomfortable or vulnerable and so the environment must be respectful and supportive. The magic of this form of conflict are in the co-created outcomes that no one has thought of before. Finally, have some guidelines or rules so that people understand the framework for healthy conflict. These guidelines will help guide the process, ensuring a respectful, engaging conversation even when it becomes tense and stressful. Good healthy conflict results in high quality solutions and better decisions. This isn’t about win/lose, conceding or concessions. It is about being comfortable with the unknown and co-creating great things using the best strong minds. The energy may be tense and passion may be exposed however when conflict is healthy our brains do what they are designed to do: to think creatively, to draw on insight, and to discover new ways of connecting. Conflict isn’t bad, it’s the conversations that cause it to be so. Therefore all conflict management strategies are really about changing the conversation. How many meetings do you have in a day, week, month? Whilst some meetings will be meaningful: that is they achieve outcomes and are positive, chances are there are some meetings that you find disengaging, boring, or a complete waste of time. Why are so many meetings that we attend, so bad? Whilst we may feel that the meeting has merit and a good intention, the impact is often not considered. Meaningful meetings have positive impact. How can we improve the impact of a meeting and make it a meaningful meeting? Call out those who judge, criticise or make condescending comments toward other’s ideas and contributions. Judging shuts others down causing them to disengage and stop contributing. Keep a positive environment so that everyone feels they can participate. Unless the discussion on a past event is to learn from it, there is no point it being raised. All too often meetings are taken up with talk of what happened last week. Meaningful meetings are about what we are working on this week/month, what support we need, what barriers / challenges we are facing. By all means celebrate/recognise achievements, just not the details. All too often we go into meetings only to find most of the actions set last meeting haven’t been completed. Either the list of actions grows longer or the meeting just gets bogged down. Ensure everyone is committed and accountable from the start. Discuss actions to ensure shared meaning and understanding. Discussion problems to co-create solutions so that progress can be made. Meaningful meetings are about moving things forward. Some meetings such as department meetings, management meetings, senior leader meetings happen week on week, year on year. Ensure there is a purpose to the meetings that is co-created, appears on the agenda and minutes and is reviewed to ensure relevance. Just because there is a leadership team doesn’t mean they have to meet. Meaningful meetings always have a purpose, it needs to be front of mind and can be called upon when the discussions go off course. 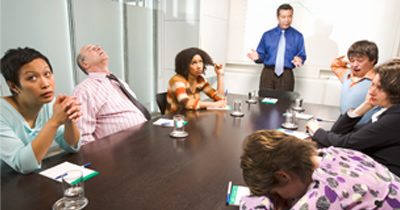 We are all busy and wasting time in meetings is one of the biggest frustrations employees and leaders have. Let’s help them manage their time better. Embedding one of more of these tips into your next meeting will result in a change in the levels of engagement from the participants. I was at my yoga class last week and we are asked to surrender to trust. This caused me to think because surrender usually means weakness and raising the white flag. However surrendering to trust isn’t a weakness at all. To surrender to trust is to pull down the barriers that prevent you connecting with others and building relationships. We live in a world that seems to promote distrust rather than trust, just peruse a newspaper to see what I mean. And yet our brain is hardwired to trust and to be trusting. We have a whole frontal cortex that activates when we feel trust in the room. The capacity of this part of the brain is what sets humans so far apart from our animal neighbours. We are slowly understanding what humans are truly capable of. Look around and you will see the results of humans using the best parts of their brains. Medical treatments and technology, engineering feats and a lot of things that weren’t even thought of a few decades ago. To be human is to be curious and to innovate. Throughout history humans have always explored, asked “what if?”, and searched for answers. Many continue to do this today. When we trust we open our brain to discovery and are thus able to perform great things. We are connect and share which allows the flow of ideas and deeper conversations. We can plan, imagine, and gain insight. The networks created in our brains are hugely complex and ever growing. We all have this ability to utilise our brain’s capabilities. However, we limit it when we choose to live in a safe environment preferring our lives to remain unchanged, predictable, and known. We shut down our ability to realise and unlock our potential. A life of safety and certainty are the outcomes of our primitive brain’s power over us. This brain’s function is to keep us from harm and is constantly alerting us to possible threats in our environment. The more we live like this, the more these networks in our brain are activated and grow very strong. We can see this in our workplaces when there is resistance to change, when people judge others because of a perceived difference, being in meetings with people addicted to being right, and when people become overwhelmed and anxious. It is not easy for someone to move out of their comfort zone and start living a life of experimentation, opportunities and possibilities. Our primitive brain will fight the uncertainty as it can’t make sense of things it doesn’t yet know. The brain will question our motives, drag out old memories, past experiences, and emotions trying to convince us not to take on the risk. Our self talk is what stops us trusting people and opportunity. What level of trust do you have? When you next find yourself in conversation with a work colleague, peer, boss, allow yourself to observe the interaction dynamics taking place. What is your level of trust for the people &/or the proposal? How open are you to sharing and listening to connect not to reject? Are you feeling resistant, skeptical, or somewhat fence sitting? Or are you feeling open and engaged with the conversation? How vulnerable are you prepared to be in this audience? When we become conscious and aware of our behavior and the dynamics of the relationship, we can improve the environment by changing our conversation. When we allow ourselves to trust more in people and in conversations we get far more out of the discussion. In a work sense this results in better decisions, more considered solutions, and you may find siloes and barriers start falling away. Better still our mindset is contagious, you will see others move their thinking more towards possibility. The changes may not happen in the first conversation however, everything starts with a conversation. Can you surrender to trust?